Before our big trip to Washington, Nathan and I had a date night where we delivered cupcakes to our friends. Cupcakes aren’t easy to deliver. So I made cupcake boxes to hold them in and that way they won’t get all over my car as we drove them to people’s homes. These were simple to make. I used cardstock but quickly found out that they weren’t sturdy enough to hold cupcakes. So next time I make it, I think I will put a sheet of card board at the bottom to help hold the cupcakes a little better. Remeber, if you made something inspired by Simply Modern Mom, please upload pictures of it to our Flickr group and show it off to everyone. You may be featured on Simply Modern Mom. 1. View or print the cupcake box pattern. It is in PDF format and it will print on 12 x 12 inch paper. So the easiest thing to do if you are printing it would be to have it print on the wrong side of your cardstock you are using. If your printer doesn’t have the capacity to print 12 x 12 inches then using a ruler, draw a line 2-inches from the edge on each side of the cardstock. And follow the instructions on the pattern. 2. Follow the instructions on the pattern. Fold all the dotted lines and cut where there are solid lines. Once you cut the corner tabs, glue the tabs onto the inside of the sides of the box. 3. 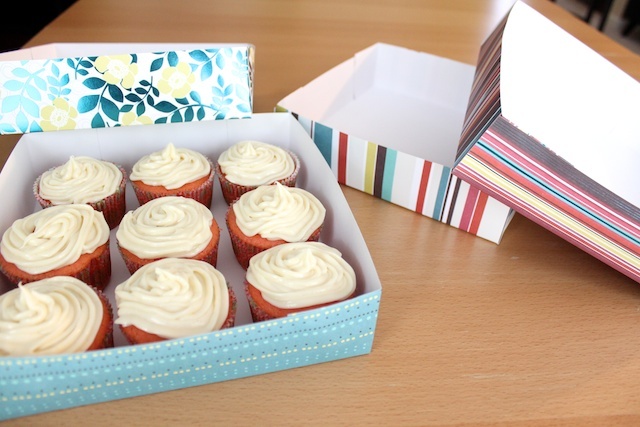 Place the 8 x 8 inch cardboard at the bottom of the box then place the cupcakes on top of the cardboard. If you want to make the bottom of the box look nicer, you can place a 8 x 8 inch doily or printed carstock over the cardboard. You can fit 9 regular size cupcakes in one box. 4. This is an optional step to make a lid for the box. Use a second sheet of 12 x 12 inch carstock. Cut 1/16-inch off 2 adjacent sides. Then using a ruler, draw a line 2-inches from each edge of the paper. Then repeat step #2 to finish the lid. If you are using a lid for your box, your cupcakes with frosting on top must be 2-inches or shorter or else the lid will smash your frosting. 5. This is another optional step. If you are concerned about your cupcakes sliding around inside the box, then you can make dividers. Download and print the cupcake box dividers pattern onto 12 x 12 inch cardstock paper. Follow the instructions on the pattern to cut out the 6 strips of dividers and its grooves. Then put together the dividers like a square grid with 3 strips of dividers with the grooves facing up and 3 strips of dividers with the grooves facing down. And done! Now you can deliver your cupcakes in style. » Tell me… How do you deliver food to people? Do you put it in disposable containers or do you use your dishes and ask for them back? Thanks so much for this…so clever!! Very cute! I will have to remember this. Oh WOW! I have been looking for something like this- perfect! Thanks so much, I’ll be linking. I pick up odd and end beautiful plates at yard sales for 25¢ and put my cookies or bread or whatever on that and tell my friend to keep the plate. It’s a quick, easy and beautiful way to deliver a smile. Oh, and I really, really LIKE this tutorial! Thanks for sharing it. That is adorable!!! I love it so much. I want to make some cupcakes just so I can tote them around in that cute box! thanks jen! i love being on your site! Great idea! I have plenty of cardstock & chipboard! Thx for sharing! Very useful idea. Now I have to make cupcakes just so I have an excuse to make these boxes! very clever. Thanks for sharing the template. Hobby Lobby actually has these clever boxes with a window in them that would be perfect to tote your cupcakes next time you do them. Great thing is they are very affordable….like $1.00. Also have a suggestion for you on yours with the template. Maybe use a higher pound paper and use the cardboard base like you said you would. This is stunning! I normally deliver in disposable plastic cupcakes containers. I used mead folders for this and it was sturdy enough to hold the cupcakes and left enough room for high frosting. I cut off the pockets, leaving 1/2″ to fold over to look uniform, gluing with a glue gun. Then followed the rest of the directions. Looks super cute!